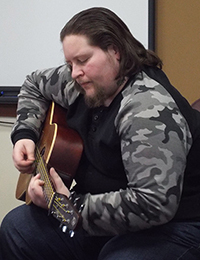 When veterans participate in Voice of Valor, most enter the program thinking they do not have the musical experience necessary or that they won’t be able to express themselves, but once they sit down with the welcoming teachers and musicians, this changes. With the support of these professionals, the participants feel right at home and are able to open up musically, something most of them thought was not even possible. Voices of Valor strives to make all veterans comfortable and confident as they share their memories and experiences of war. While this may seem difficult, this is why we are here. We welcome all veterans, any age and background, to share their experiences through music. Our supportive team of musicians and teachers is here to make this experience as healing as possible. Just as Richard says, even if you don’t think you have musical ability, this is something you should try! Everyone has music inside of them, and by joining a Voices of Valor program, you will be able to find that music deep inside you.